Continuing to use current issue 34 of Film International (Vol. 6, No. 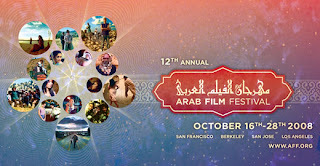 4) to more fully appreciate the contours of Bay Area festival culture, I want to take a look back at the recently-completed 12th annual Arab Film Festival to detail what emerged as excellent in this year's edition. First and foremost, I must single out the accomplishments of Artistic Director Sonia El-Feki who has—for the fourth year in a row—delivered the best of Mideast cinema(s) to the West Coast. But it is not only her acquisition and choice of content that has made her programming efforts so remarkable; it is the supportive audiences she has developed in direct response to that content, as well as one of my all-time favorite aspects of film festival culture: the opportunity for audiences to interact with the filmmakers. This year's edition had a high proportion of attending filmmakers, some invited, some who came on their own, to take part in the communal experience of the Arab Film Festival. Though I am aware that many of these Q&A sessions are filmed or recorded for various festival archives, rarely are these audiotaped or videotaped sessions made readily available to the general public and—as valuable as I believe recorded or videotaped sessions are for their sheer indexicality—I nonetheless prefer the journalized transcript, filtered through individual sensibility, and rendered as biographical document, easily available for cut-and-paste. To that extent, what follows are the questions I was allowed to ask at this year's Arab Film Festival. Daoud Aoulad-Syad's 2007 Moroccan comedy Waiting For Pasolini, winner of the Best Arabic Film at the 2007 Cairo International Film Festival, was chosen as AFF08's Opening Night film. As Michael Hawley anticipated in his preview, Ouarzazate—the film's picturesque locale, frequently used in countless American and European film productions—was indeed glorious to behold on the Castro Theatre's huge screen. In Waiting For Pasolini, an Italian film company arrives in Ouarzazate to shoot a biblical epic, turning the village upside down. Everyone wants to get in on the act because their economic well-being depends on it, resulting in—as Hawley synopsized—"an entertaining social comedy about cross-cultural misunderstanding and exploitation." The scene that most amused me was when the villagers, idling around on the movie set costumed as Roman centurions, notice a passing burial procession and—obliged by their faith—elect to participate. The contrast between Islamic burial rituals and Roman-Christian garb was deliciously absurd, especially when the actors were abruptly called back to the movie set mid-burial. This humorously-enunciated scene made me curious who had influenced Aoulad-Syad's flair for comedy? Aoulad-Syad responded that he has shown Waiting For Pasolini all around the world and that particular scene is precisely the one that has made everyone laugh, showcasing for him that cinema truly can be a universal medium. Italy's comedic filmmakers have definitely had a huge influence upon him. Even in Morocco the scene worked well despite its wry criticism of the touchy subject of Islamic religious rituals, emphasizing yet again that—by poking fun at something—criticism can be effected. His next film will likewise be a comic critique of the Islamic faith, expressed by way of a nudge and a wink, without resorting to aggressive shock tactics, which Aoulad-Syad disfavors. He remains convinced that everything can be conveyed and communicated through humor. True to his name, actor-director Amor Hakkar is an enthusiastic, affectionate filmmaker. When La Maison jaune (The Yellow House, 2008) won an honorable mention for best narrative feature at the AFF Noor Awards, Hakkar embraced and kissed every jury member on stage, twice. Hakkar refamiliarized himself with Algeria 10 years ago when he honored his father's dying request to be buried in his home country. In similar respects, the narrative trajectory of The Yellow House concerns a man's efforts to keep his family together and intact on home turf. 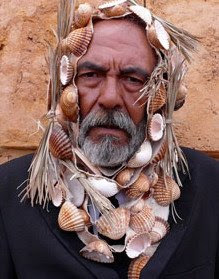 He portrays protagonist Mouloud, an Algerian potato farmer, who is informed his son Belkacem has been killed in a vehicular accident while serving in the Algerian Army. 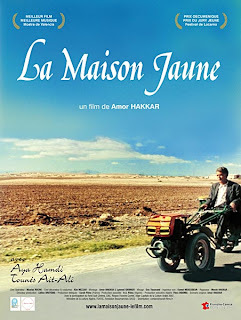 The first half of the film shows Mouloud's travels across sun-kissed Eastern Algeria by motor-cart to retrieve his son's body. 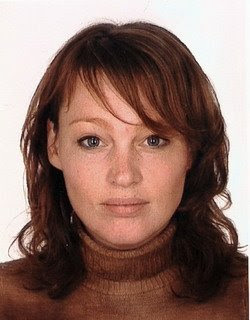 The second half involves his efforts to retrieve his wife from the isolating grip of grief, first by trying to lift her spirits through a pet dog, then by painting their house yellow, and finally by going to great lengths to arrange for her to see a videotaped message Belkacem made shortly before his death. I much appreciated the eclectic score of The Yellow House (which won Hakkar the Meilleure Musique at the 2007 Valencia Festival of Mediterranean Cinema) and was intrigued by the sequence where Maloud arrives in the city at night and is on his way to the police station to make initial inquiries. This interlude was scored with an atmospheric delta blues slide guitar. Though emotionally appropriate, the choice was conspicuously at odds with the rest of the film's more traditional oud-accompanied Algerian and African chants. I wondered about this musical choice. Hakkar admitted that—though he approved the choice—it was not really his. Hakkar lives in a little town outside of Paris near the Swiss border and after the film was completed, he set his sights on securing a large-name composer to score the film. He was dissuaded by his producer Céline Brotons, with whom he frequently works, who reminded him that they had made the film on very little money and should stay on course. She recommended they secure deserving musicians from his French hometown. He gathered a group of local musicians together, showed them the film without music, and offered them the opportunity to each score a scene, according to their heart; but—precisely because he didn't want them to overthink it—he gave them only two days to return with musical choices. It was the particular choice of the musician to use the delta blues slide guitar; but, Hakkar agreed, it felt right. The Yellow House struck a skillful balance between tenderness and absurdity, as noted by Michael Hawley in his critique that the film strained credibility when it concentrated on Maloud's efforts to secure electricity in his small village solely so his wife could watch her son's videotaped message. "Wouldn't it have been a thousand times easier to just bring his wife to the café to watch their son's 30-second video?" Hawley wondered. Because he is so much in pain and because he sees so much pain in his wife, Hakkar suggested that Maloud was blinded by grief and made forgetful of the reality of things. Even though he knew they had no electricity, he still brought the VCR player to the house, hoping to play the videotape. The balance of absurdity and sadness reflected that the family's balance was at stake. Hakkar suddenly seemed insecure with his answer and he asked me if his answer worked for me. I told him that how I read this rather illogical development was that in the son's message about how much he wished to return home to see the Aures Mountains, it somehow seemed exactly appropriate that his wish would be expressed within the house where he grew up. Absolutely, Hakkar responded enthusiastically, though he conceded there could be many interpretations; another perhaps being that light—electricity—would illuminate the future of a family darkened by grief.